The 1991–92 NHL season was the 75th regular season of the National Hockey League. Twenty-two teams each played 80 games. The Pittsburgh Penguins repeated as Stanley Cup champions, winning a best of seven series 4–0 against the Chicago Blackhawks. As mentioned above, 1991-92 was the 75th anniversary season for the NHL. Accordingly, all players wore a patch on their uniforms depicting the NHL 75th anniversary logo (seen at above right) for this season. This was the first season for the San Jose Sharks, the first expansion team in the NHL since 1979. The birth of the Sharks returned NHL hockey to the San Francisco Bay Area after the California Golden Seals had relocated to Cleveland, Ohio in 1976. This was also the last season for John Ziegler as NHL President. He would be succeeded by Gil Stein, who held the position for one year before being replaced by Gary Bettman. New York Rangers defenceman Brian Leetch became the fifth, and last as of 2009, defenceman to score 100 points in a season. He finished the season with 102 points and captured the Norris Trophy. The Rangers also ended the season with the NHL's best record since the 1941-42 season, the same year as the Toronto Maple Leafs' stanley cup comeback. For the first time, the NHL finished play in the month of June. A primary reason for this is the 10-day NHL strike that started on April 1. The games that were supposed to be played during the strike, which was the first work-stoppage in NHL history, weren't canceled. They were rescheduled and made up when play resumed on April 12. The 1992 playoffs saw history being made. For the first time ever, all four division winners (Detroit, Montreal, NY Rangers, Vancouver) were eliminated in the same round. In the division finals, Detroit was swept by Chicago in four straight. Montreal was also swept in four straight by Boston. The New York Rangers lost in six games to eventual champion Pittsburgh. And, Vancouver also lost in six games to Edmonton. This wis the last year the Hartford Whalers would make the playoffs until 1999, their second season as the Carolina Hurricanes. Of the eight division semifinal series, three of them would take place again the following year. Vancouver defeated Winnipeg four games to two. Buffalo swept Boston in four straight. And, St. Louis swept Chicago in four straight. 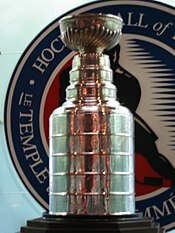 The series was held between the defending Stanley Cup champion Pittsburgh Penguins and the Clarence Campbell Conference champion Chicago Blackhawks. The Penguins won in four games, three out of four won by a one-goal margin. Mario Lemieux of Pittsburgh won the Conn Smythe Trophy as the playoffs' MVP. As part of the NHL's 75th anniversary celebration, and taking cues from Major League Baseball's "Turn Back The Clock" uniform program, throwback uniforms were worn by Original Six teams for select games, and throwbacks were also worn for the All-Star Game. The throwback uniforms would have an impact on future seasons in the NHL, as several teams adopted throwbacks as alternate jerseys. The National Football League and National Basketball Association would follow the NHL's lead, with teams wearing throwbacks to celebrate their leagues' 75th and 50th anniversaries, respectively.